The source for this Sprenger innovation is derived from the well-known stainless steel product range, selected products are then completely exposed to a galvanizing process which colours the upper layer of the material. Thus the colour is not only on the surface, it also penetrates down into the substrate which considerably reduces the abrasion during use. Numerous tests confirm the surface behaves in the manner described. Depending on the nature of the fur a long lasting surface colour will be achieved. A warranty against colour abrasion, however, can not be granted. With continued use the colour may lighten somewhat developing an “antique-look” over time. The quality of the metal is not affected by this visual change to the appearance. Slight colour deviations are possible between different batches as a result of the manufacturing process. Due to this characteristic it is not recommended for dogs with a white or bright fur. The well known advantages must be the reason why competitive dog sport people and professional dog handlers increasingly choose stainless steel over the alternatives. Although Sprenger collars made of stainless steel command a premium price compared to the standard steel chromium plated collars, the features such as the toughness and high tensile strength is accompanied by the improved safety aspect and easily justifies the discrepancy. This is a high performance product that is absolutely worth its price. The outstanding quality enables Sprenger stainless steel collars to last over a dog’s lifetime, and is often passed on the next generation. 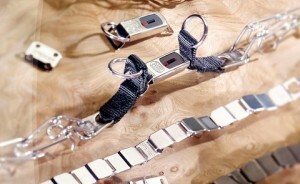 Chromium plated collars by Herm. Sprenger stand out due to the high-gloss surface. We achieve this result by not only cleaning the raw chain from metal debris and oil, but also through our own process which gives the collar a special surface polish. This process ensures that the nickel and the chromium layers adhere especially well and the collar has a long lasting protection against rust. 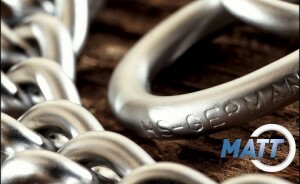 The durability of the nickel coating is additionally tested through a “bending test” performed on the rings. If the nickel coating behaves as flexible as required and the coating does not flake off then the next step of the production, the manual processing of the chromium plating with the use of a frame follows. Elaborate processing methods and quality control guarantees both an excellent chromium plating, and combined with the prior process of nickel coating also provides a dual anti-rust protection. Damage however, occurring to the surface of the chain by external influences, can make the metal core vulnerable to water ingress and variation in temperature. It is for this reason that we cannot undertake a rustproof warranty for any of our products made of plated steel, regardless of the surface finishing. Our nickel and chromium baths are monitored constantly by a laboratory and are disposed of according to the current environmental laws and regulations. Collars with this plated surface have the same production process as the collars made of chrome plated steel. Only the surface of the two collars is different. The gold plating is just a decorative surface. 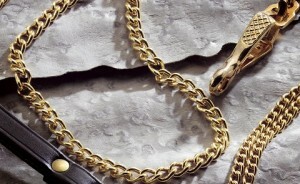 Gold is a very soft material and the nickel plated steel collar underneath will have a thin gold plated surface. If we were to coat the nickel plated steel collar any thicker then the price would be on par with gold jewellery. We recommend using these collars only for special events and not for daily use. The surface will inevitably experience abrasion after longer term use. As a result of the thinner coating, the abrasion of gold plated collars will become evident earlier than other materials. 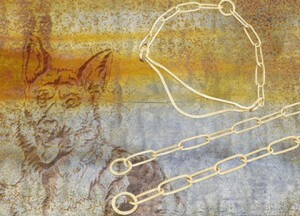 The traditional long-link collars made of solid brass may be better known than collars made of stainless steel or CUROGAN as they were used by dog trainers whilst training and appeared at trade shows for a long time before the production of collars in the other materials began. Brass is a copper-zinc alloy which is much softer than other materials we used for our production. Therefore the abrasion is a little bit higher than the same collar made of Curogan. This difference is probably the reason that CUROGAN has become more popular in recent years. Nevertheless the brass collars are still sold regularly as the natural warm colour harmonises with many fur colours. Due to the high flow characteristics of brass it is possible for Sprenger to only produce long link collars. As the abrasion is higher than normal it is important to inspect, and if possible, to replace the collar from time to time so that the security of the dog is maintained at all times. For dogs that react to wearing conventional collars with fur discolouration, CUROGAN is a proven alternative. It is not only because of the anti-allergic features, but also because of the appealing look that the CUROGAN collars are becoming ever more popular. The very high copper content gives the collar a brilliant colour which antiques and darkens over time with regular use. The original condition can be restored by using Sprenger Diamond paste metal polish or other commercially available polishing pastes. When using CUROGAN collars please take into consideration that the abrasion between the links is slightly higher than compared to the standard steel and stainless steel chains. The relatively high percentage of copper and the inherent characteristics of the metal will, depending on the conditions of use, lead to a thinning in the wire gauge of the links. For this reason we recommend visually inspecting the collar at regular intervals to be able to replace the collar in good time. In production the Satin Chrome finishing is not particularly different from the standard polished Chromium Steel Plating. 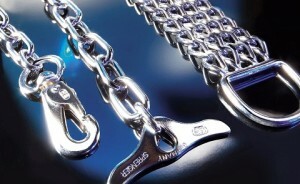 The high-gloss polished raw chain receives its brilliant satin shine through the processing of the high quality nickel coating and the subsequent chromium plating. Satin Chrome presents itself as a very durable surface which will not lose its finish through abrasion by the dog’s coat. Numerous stress tests also confirm the longevity of the Satin Chrome finish which does not lose its satin surface properties during use. Generally, poor treatment of the collar can lead to surface damage. The dual galvanising processing used on the steel achieves very good protection against rust. However, through a high variation in temperature and contact with water the occurrence of flash rust is possible. To enjoy the collar for as long as possible we recommend taking appropriate care of it as taking insufficient care of a steel collar can lead to rust formation. For this reason we can not undertake a rustproof warranty.